A Labyrinth is a walking meditation tool that takes us from a path of what appears to be crisis and confusion, to a journey that has purpose and direction, leading us to our spiritual center. 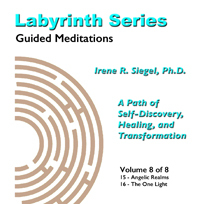 The Labyrinth Series guided meditations are designed to lead you on a journey of healing and transformation. Through the power of imagination, your mind can access your ability to activate your own healing potential. Whether you need healing for a physical illness or injury, an emotional issue, or are looking for greater spiritual awareness, this series will lead you back to a restoration of balance and the integration of the body, mind and spirit. You will have an opportunity to use these meditations for your own specific needs and issues. 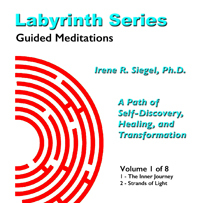 As you progress through the series, you will go deeper into your own personal work and healing. These guided meditations and visualizations are an invaluable tool to utilize along with your health or mental health treatment, or to go deeper on your own spiritual path. The beautiful musical background on these CDs is by Thaddeus and will gently carry you to a place of stillness within yourself. Find your way out of the confusion, and back to your Center Point. 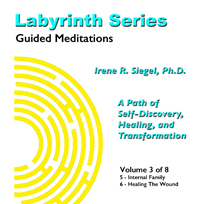 Irene Siegel, Ph.D. teaches and conducts her clinical practice. She received her masters degree in Social Work from Columbia University in 1977, and has studied ancient healing arts throughout North and South America. She lectures, leads workshops and groups, and is the author of Eyes of the Jaguar. CDs are available individually. MP3s are available individually or as a complete set. See below. Suggestion: Don't download the MP3s directly to your phone or MP3 device because they could get lost with the device. Instead, download the MP3s to your computer. Save them. Then, transfer them to your phone or MP3 Device.